I didn’t realize it until I tried it this year, but if I put blocks on the floor, one of my cats will appear and mess them up. So I put them up on the temporary design wall to get a photo of all of them. If you look closely, you may notice that I chose my third fabrics–in addition to the Greenery-inspired green and the tan and pink backgrounds that are inspired by the palette of colors that Pantone predicts we’ll be seeing in Spring/Summer of this year in Fashion. 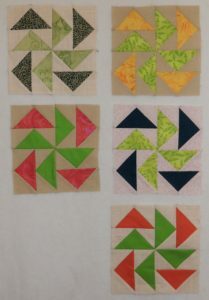 I’m donating the chances for these blocks … while I continue to try to get organized enough to make some progress on some other Block Lotto projects.